ORMOC CITY – Dir. Rowin P. Riños, Dir. 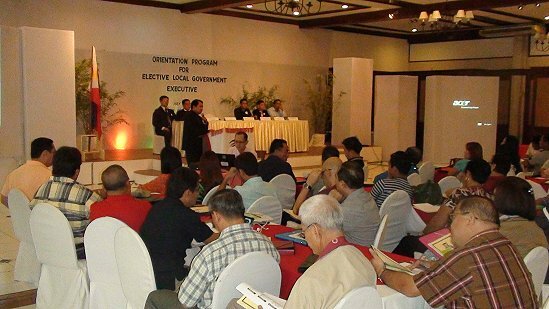 III, Acting Regional Director of Civil Service Commission Region 8 oriented the elected officials in Eastern Visayas recently held at Sabin Resort Hotel in Ormoc City. Almost 300 elected officials in different parts of the region attended the seminar. Atty. Michael M. De la Cruz, Dir. II, CSC Biliran Field office with Western Leyte satellite office said that only 150 officials confirmed on their invitation but they managed to accommodate all the participants. Old and neophyte politicians comprised the 280 participants. Dir. Riños said that they will set another schedule to accommodate other unavailable elected officials. He however said that they only invited the executives for it is not compulsory but wished that everybody can attend the OPELGE. The Orientation Program for Elected Local Government Executives (OPELGE) is usually conducted every after election and is intended for new elected local executives; governors, vice-governors, mayors, vice mayors, and members of the sangguniang panlalawigan, panlungsod and pambayan. Riños said that CSC aims to orient participants on the civil service laws and rules that they need to observe in rendering their service. “Knowing these rules can properly guide them and avoid violations specially pertaining to civil service matters on personnel management,” Dir. Riños added. The different topics were Csc programs & functions, duties & functions of local executives, appointments and other personnel actions, modes of separation & administrative disciplines. The director said that they selected Ormoc City as a venue for this activity just for a change and because it can accommodate a lot of participants. They usually held the OPELGE in Tacloban City. In the course of the interview, Dir. Riños took the opportunity to call anyone who wishes to take the Civil Service eligibility examination on October to file their application in their various offices. The deadline of application is on August 30. Applicants must be 18 years old and above and should bring along photos, valid identification and 500 pesos filing fee. MALACAÑANG – President Benigno S. Aquino III has revamped the Inter-Agency Committee on Children in Armed Conflict (IAC-CIAC) under an executive order aimed at further strengthening the government’s program for the protection of children against armed hostilities, abuse and exploitation. Executive Secretary Paquito N. Ochoa Jr. said on Thursday that President Aquino signed on August 2 Executive Order No. 138 amending Executive Order No. 56 (S. 2001), and places the IAC-CIAC under the direct supervision of the Council for the Welfare of Children (CWC), instead of the Office of the Presidential Adviser on the Peace Process (OPAPP). Under EO No. 138, the CWC will be the lead agency in the implementation of the CIAC Program Framework, which addresses the alarming involvement of children in armed conflict, either as combatants, couriers, spies, medics, cooks or their recruitment for sexual purposes, among others. The council will also be in charge of coordinating and monitoring of the program framework at all levels. The Department of Social Welfare and Development had earlier sought the establishment of the Monitoring, Reporting and Response System for Grave Child Rights’ Violations (MRRS-GCRV) in situations of armed conflict to be headed by the CWC in order step up government response to the problem of children being recruited, killed, maimed and abused in areas of armed hostilities. “Given the commonalities between the existing CIAC Program Framework implemented by the OPAPP and the proposed MRRS to be implemented by the CWC, and in line with the policy of streamlining government functions to avoid duplication of efforts, EO No. 56 is hereby amended to incorporate the proposed MRRS and reorganize the IAC-CIAC, thus strengthening the CIAC Program Framework,” Ochoa explained. The MRRS-GCRV will now serve as the monitoring arm of the inter-agency committee. The OPAPP remains a member of the inter-agency committee, along with the Commission on Human Rights (CHR); the Departments of Education (DepEd), Foreign Affairs (DFA), the Interior and Local Government (DILG), Health (DOH), National Defense-Armed Forces of the Philippines (DND-AFP), Justice (DOJ), and Social Welfare and Development (DSWD); the Philippine National Police (PNP); the Presidential Human Rights Committee (PHRC); and the Presidential Management Staff (PMS). In line with the enhancement of the CIAC Program Framework and the new set-up, Ochoa said, the CWC and member-agencies are mandated to craft a memorandum of agreement to define and delineate their functions and duties within 60 days after the presidential directive takes effect. EO No. 138 also mandates the IAC-CIAC to observe all international instruments on upholding the rights and welfare of children and other related human rights treaties in all initiatives in the formulation of guidelines and programs for the handling of children involved in armed conflict, among others. It should also conduct training, advocacy and information campaigns and capacity-building of local government units (LGUs). The Philippines is a state party to the United Nations Convention on the Rights of the Child (UNCRC) and the Optional Protocol on the Involvement of Children in Armed Conflict. President Aquino also ordered national government agencies to formulate and integrate the program framework in their annual programs and projects in consultation with the CWC. “LGUs of areas affected by armed conflict may also develop and implement complementary programs to carry out the enhanced CIAC Program Framework in coordination with the CWC,” Ochoa said. Funding for the implementation of the CIAC Program Framework will come from the current appropriations of participating agencies and subsequent funding for the implementation of the CIAC Program Framework will be incorporated in their respective regular appropriations. EO No. 138 takes effect 15 days after its publication in a newspaper of general circulation. Senate Majority Floor Leader Alan Cayetano made this statement Friday as he compared the rampant corruption and other forms of anomalies in the Bureau of Customs (BOC) as the new ‘wangwang’ irking the President and the people. In a press conference, Cayetano urged the government to introduce not just proposals, but “major, bold, (and) radical reforms” to put an end to alleged corrupt practices among officials and employees of the BOC. “Raising the issue in his SONA is already a stern warning and I believe [President Aquino] will effect changes himself in the BOC should nothing happen in the next few weeks,” Cayetano said adding that he would support major reforms being pushed by the administration to cleanse agencies known for being ‘corruption hotspots’. Cayetano likewise said this is the best time for Customs Commissioner Rufino “Ruffy” Biazon to have the political will to lay down workable and pragmatic yet comprehensive reforms in his agency. "I do understand the difficulty of having to effect a reform, but now that Commissioner Biazon and Commissioner (Danny) Lim are in the middle of this issue, and they have the support of the President and the people who want radical reforms in the agency, they should take this as opportunity to address the problem of corruption in the BOC," Cayetano pointed out. To reaffirm the gravity of the issue, Cayetano cited a statement from the President's SONA, claiming that over P200-Billion worth of government money is lost due to corruption within the bureaucracy. This amount of money, according to Cayetano, could have been spent on building 800,000 7x9-meter classrooms, providing 20 million scholarships for primary and secondary education, paying 650,000 public school teachers, loans for about 10 million small scale enterprises, or even on increasing Conditional Cash Transfer (CCT) beneficiaries by about 13 million – all of which would have improved the lives of many Filipinos. The Senator said even if government tried to fire everyone working within the BOC, this “radical” move would not entirely put an end to corruption since the replacements may be just as corrupt as the old officials. “I am not generalizing but corruption is still widespread,” he added. Cayetano cited a 2012 SWS Survey of Enterprises on Corruption saying that although the Bureau of Customs improved its net sincerity rating in fighting corruption, the Bureau (still) distinguishes itself as the sole institution with a Bad rating. According to the senator, the survey showed that out of 20 government institutions rated for sincerity in fighting corruption, 17, including the BOC, improved their net sincerity ratings from 2009 to 2012. Despite the increase, however, the BOC's rating remains to be the only bureau recorded to have a Bad net sincerity rating of -45. “Corruption still exists according to my consultations with the business sector and brokers. Even legit(imate) kargamento, may politika at lagayan... May lagay sa bawat container, lagay sa kulang na papeles,” he said. Cayetano added that corruption in the BOC has been the problem of past and previous administrations, with reports about the rampant smuggling of oil through special economic zones and agricultural products that is costing the government billions of pesos. “The past administrations encountered problems when the government tried to thoroughly investigate the employees and officials before. But I’m sure if the President will do this now, he will not back down,” the Senate majority leader said, adding that he has high hopes that the BOC will be cleansed through the Aquino administration’s campaign “Tuwid na daan”. “I think this is the time' for real reform (referring to the BOC). In our country, reforms will not start until the perpetrators are caught and punished,” Cayetano said. CHICAGO, IL – In a keynote presentation on Wednesday, former Vice President Al Gore officially welcomed six Filipinos among more than 1500 new members to the Climate Reality Leadership Corps. As part of his day-long session with attendees, Mr. Gore, the Founder and Chairman of The Climate Reality Project, delivered an updated slideshow presentation first made popular by the award-winning An Inconvenient Truth. Among those who were trained are United Nations news correspondent Tonie Marie Bacala and peace worker Maria Marasigan based in New York; engineer Marc Caratao D.Mgt., sustainable management students Nicole Cruz and Ny-Ann Nolasco from California; and engineer Francisco Alvarez ME, PME of Chicago. “We are glad that Filipinos based in the United States have been trained to spread the reality of the climate crisis and hoping that they would be able to speak up and win the conversation on extreme weather brought about dirty energy which has caused series of disasters in the Philippines,” said Rodne Galicha, district manager of The Climate Reality Project in the Philippines who also serves as executive director of Romblon-based environment organization Sibuyan Island Sentinels League for Environment Inc.
Galicha, who mentored more than 90 Asia-Pacific participants coming from 21 countries, said that the role of Filipino-Americans in the climate conversations is to make Americans realize that the burning of fossil fuels, over-consumption and investing in climate-inducing industries are making the lives of communities in the developing and least developed countries especially in the Asia-Pacific region such as Bangladesh, India, the Philippines, Pakistan, Thailand and India. “We can directly harness the power of nature such as wind, water and the heat of the sun – we have the technology to utilize and the creativity but we need political will to do it. Our country is blessed with beautiful 7,107 islands: with free and clean sources of energy – but there is no such thing as clean coal, it is still coal, dirty coal,” newly-trained Dr. Marc Caratao, an engineer by profession and born in the province of Cebu. “I have seen the devastation of hurricane Sandy in New York but I am also alarmed with the disasters that are becoming a new normal brought by the climate crisis in the Philippines affecting our poor communities including the indigenous peoples. Yes, climate change is the cause but the vulnerability of our communities is increased by industries with investors based outside the country – they must be held accountable by paying their climate debts and pulling out their investments from disaster-inducing businesses such as mining,” said peace worker Maria Marasigan. “Some people may deny the reality of the climate crisis but what we know is that our families, relatives and friends including our poor vulnerable communities back home are experiencing unusual weather patterns resulting to loss of livelihoods and lives. These are all not a hoax nor a scam! Climate crisis is, indeed, real,” said journalist and UN correspondent Toni Marie Bacala. For Chicago-based Engr. Francisco Alvarez, Filipino families must be able to understand the reality of the climate crisis haunting their relatives in the Philippines. “We must continue educating our Filipino families about the plight of our people back home, why are they suffering the effects of climate change and how are we able to extend assistance which is long term and invest in clean and green businesses in local communities where we come from,” said Alvarez. Volunteers from all 50 states and more than 70 countries attended the Climate Reality Project’s twenty-third training program, and participants included teachers and students, academics, lawyers, physicians and nurses, entertainers, homemakers, business leaders, entrepreneurs, public servants, and more. Following the training, Climate Leaders emerge from the program as energized and skilled communicators with the knowledge, tools, and drive to educate diverse communities on the impacts of climate change and to demand action now. Since the program’s inception, Climate Leaders have reached millions of people worldwide through their presentations in their communities. In 2013, Climate Reality CEO Maggie L. Fox challenged Climate Leaders to undertake more than one thousand Acts of Leadership, including presentations in their communities, public hearings, and media outreach to a collective 1.3 million people worldwide. 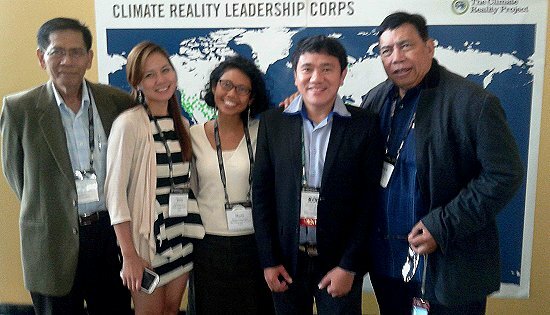 This is the second Climate Reality Leadership Corps event in 2013, following the organization’s largest-ever international training program in Istanbul in late June 2013 with three Filipinos in attendance: Sonja Garcia Antonio from Davao City, Zephanie Mari Repollo fom Dumaguete City and Elirozz Carlie Labaria from Tagbilaran City. In 2012, 24 Hours of Reality: The Dirty Weather Report broke the world record for viewers of a live online event, with more than 17 million online views, and won ten prestigious Telly Awards for excellence in online content. The broadcast also generated more than 165 million impressions on social media. In 2013, we plan to smash this record. For more information, please visit www.climaterealityproject.org. Mr. Gore also announced that The Climate Reality Project will serve as a co-host of the first-ever climate segment at this year’s Social Good Summit in New York City on September 23, and that he will provide the keynote address at the first-ever Climate Segment at the Summit. Mr. Gore will be joined by some of the world’s leading bloggers and social media influencers, as well as Kandeh Yumkella, head of the United Nations’ Sustainable Energy For All initiative; Steve Howard, Chief Sustainability Officer at IKEA; Pete Cashmore, founder of Mashable, the world’s largest blog; Helen Clark, head of the United Nations Development Program; and dozens of the world’s biggest names on climate change. For more information, please visit www.mashable.com/sgs. PASAY CITY – Senate Majority floor leader Alan Cayetano has called for an open and transparent probe on the alleged corruption in the use of the Priority Development Assistance Fund (PDAF). “What we want is a full, independent, and honest investigation that is open to the public. So far, the NBI is doing a great job but we need to engage the people more and make them part of reform process since it is their money we are talking about,” he said in a press conference held last Friday. The Senator gave his full support to the investigations being conducted by National Bureau of Investigation (NBI) and the Ombudsman adding that this will ensure an independent and credible inquiry into these types of allegations. Cayetano however stressed the importance of granting media access and encouraging people participation in these investigations concerning allegations of high public interest similar to how the Department of Justice (DOJ) publicly investigated the 2010 Luneta hostage crisis incident. “Any case with high public interest such as this where the people’s money is being talked about, the people should be part of the reform process rather than just being aware of the result,” he said. Cayetano said that media will play a crucial role in pushing for reforms in government. “If they are part of the investigations and are able to cover, they will not only be narrators to the public, they will also be insiders to investigators given their innate capability to do their own research,” he added. The Majority Leader also reiterated his call to fellow legislators to cooperate in the investigation being conducted by the NBI by being transparent and opening their books to the assigned authorities in order to resolve this issue immediately and eventually focus more on pressing legislative matters. He said that an investigation conducted by the Senate on itself would not be as credible and convincing to the people. “First, there is less credibility if we just investigate ourselves. Second, this will keep our focus away from our daily responsibilities related to legislation,” he added. Cayetano however said that he is open to a Senate-initiated investigation on the PDAF scam if there comes a point that the NBI and Ombudsman fail to shed light on these accusations and eventually hold people accountable for wrongdoings. “I see that that the NBI and the Office of the Ombudsman are doing good. But if there comes a point where we see that they are not doing their job, I will be one of the first to propose that we conduct an investigation of our own,” he said. Cayetano said it is crucial that corruption cases be filed against erring officials involved in these anomalies in order to fully reform the bureaucracy and rid government agencies from any semblance of corruption or fund misuse. “Conducting an investigation is a first step but we also need to reform faulty systems in government to stop the cycle of graft and corruption and ensure that our projects benefit the people,” he said. The senator stressed that it is not necessary that the whole PDAF system be abolished just to rid out corruption. Instead, he recommended the abolition of PDAF projects that are being commonly used in anomalies. “Not necessarily abolish PDAF as a whole, but abolish PDAF projects that are corruption prone such as items that are hard to account if these benefited the people,” he said. Cayetano suggested that rather than using PDAF for items like fertilizers or deodorizers, it would be better if government focus the funds on medical assistance or educational grants since these types of ‘soft projects’ go straight to an institution or directly to the beneficiary. “If the system is broken, let us fix it (referring to the PDAF scam). Let us remove the corruption but not the benefits to our people. We should make sure that the people still gets the immediate benefits from these programs,” he said. TACLOBAN CITY – “Why not include the whole Sangguniang Barangay? Or the whole Congress for that matter? Or even the ones who call for its abolition – the COMELEC?” Mark Simbajon, Representative for Eastern Visayas of Kabataan Partylist, on the issue of SK abolition. “If the whole point of abolishing the Sangguniang Kabataan (SK) is grounded on the points of corruption and inefficient governance, why single out the SK?” he continued. Simbajon explained that it is rather “fishy” that the COMELEC and their supporting members of the Congress on the SK abolition is pouring it all on the SK when there are a lot more other bodies flanged with the issues of corruption and inefficient governance as well. “Take for example the Priority Development Assistance Fund (PDAF) issue with the Congress; and for the Sangguniang Barangay, not all are truly efficient in their governance – just the note that the SK is like this, and it is only a considerable microcosm of the Sangguniang Barangay and other higher government formations,” Simbajon continued. “It is also because of this that we deem the abolishing of the SK to be extreme and unnecessary; rather, we reiterate our longstanding point that what it needs is reform,” Simbajon added. Simbajon pointed that the representation of the youth in the totality of the government, even with the SK, is still minimal: only the Kabataan Partylist in Congress, the SK in the LGUs, and nothing more; thus to abolish the SK would be almost equal to shutting their voices up. “And to do so is to go against the constitution: Art. II, Sec. 13, Philippine Constitution of 1987 gives the State responsibilities to promote the well being of the youth, and encourage their involvement in public and civic affairs,” Simbajon explained. Simbajon also explained that statistically speaking, the youth comprise roughly two-thirds of the total population of the country and not to have enough representation from this roughly two-thirds of the constituents would also result in questionable good-governance. “On the other hand, as elders, guardians, or parents, when your child commits a mistake, you do not just easily send them to exile; instead, you try to correct them, teach them, and this, we believe, is what is supposed to be done,” Simbajon continued. Simbajon pointed that as a measurement of their claim for the SK reform, Kabataan Partylist has filed in 15th Congress H.B. 1963 or the SK Reform and Restrengthening Bill. “And finally, we call on President Aquino to reform not abolish the SK, since, looking back on his inaugural speech, he claims that we, the youth, are part of his priority list,” Simbajon concluded. CAMP LUKBAN, Catbalogan City, Samar – Two (2) separate encounters were recorded between the troops of 8th Infantry Division and the New People’s Army (NPA) in Northern Samar. An encounter happened between troops of the 20th Infantry Battalion and undetermined number of NPAs on August 2, 2013 in the boundary of Barangay Toog, Lavazares, Northern Samar and Barangay Guindalian, Rosario Northern Samar. After an hour firefight, the troops overran an NPA camp which has 32 bunkers, one mess hall, one kitchen and two guard posts. Additionally, the troops were able to recover assorted ammunitions for high powered firearms and magazines, one mobile phone, assorted medicines and other personal belongings. The rebels suffered undetermined number of casualties as indicated by traces of blood on site. On same day, another encounter happened between troops under 34th Infantry Battalion and more or less five (5) NPAs on August 2, 2013 at Barangay Rebadulla, Catubig, Northern Samar. Troops recovered one (1) caliber .45 pistol with one (1) loaded magazine in this encounter.